The new Samsung Galaxy S6 Edge has a fast charging feature that allows the device to charge its battery way faster than when it's charging normally. However, to be able to do so, the display or the phone itself must be off. Over the years, Samsung has mastered the way to make the batteries of its devices charge faster. In fact, the Galaxy S6 Edge supports the company's Adaptive fast charging feature. For recent Samsung devices that use Qualcomm's chipset, they too, have the capability to charge faster, thanks to the Quick Charge 2.0 feature. How will you know if a charger supports fast charging for your Galaxy S6 Edge? Read the fine print on the charger sticker. 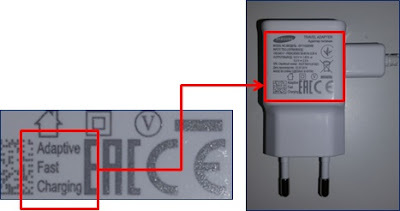 Samsung chargers capable of such feature always come with "Adaptive Fast Charging" label. How to make Galaxy S6 Edge charge faster? Turn the device or its screen off. If the phone is off, the charging icon will appear on the screen once it's plugged in. You simply cannot use the fast charging feature if the screen is on. The remaining charge time will be displayed on the screen. Only the standard and original Samsung batteries are capable of charging faster. If your S6 Edge heats up or if the air temperature rises, the charging speed will automatically decrease to prevent overheating. Do you have any questions? Leave a comment below.